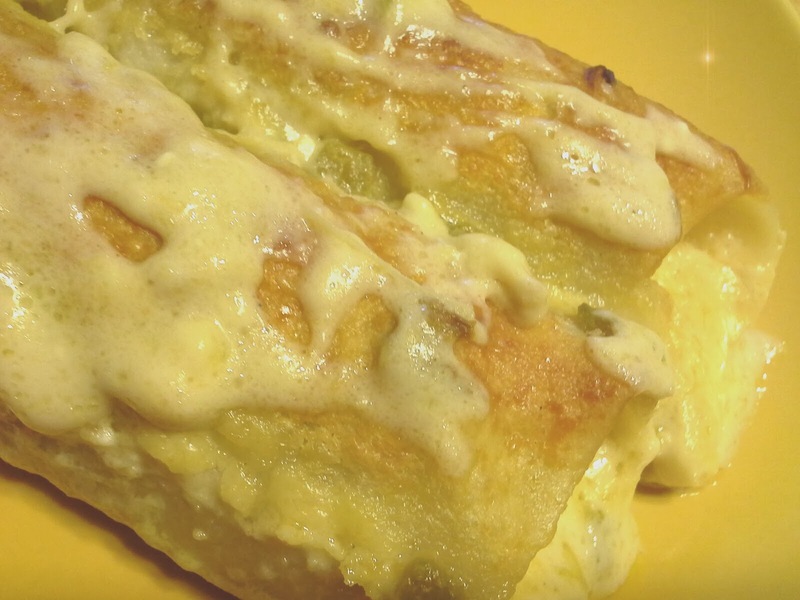 I am so incredibly into sour cream enchiladas that I could scream! If they are made right, that is. Making these right means no canned soup in any way shape or form. And using any type of fresh seasoning is a plus--enter The Spice House New Mexican Green Chile Powder. I have combined a few recipes to come up with this one and it was definitely made complete with my new and wonderful Spice House addition. This is a simple recipe and it is a total keeper for a great Mexican dinner. I don't do sides with this very often because I use a fantastic flour tortilla that is not cooked per se. I use Guerrero brand Ready to Cook Flour Tortillas. If you can get them, I strongly recommend adding them into a staple of your cooking. Not to mention New Mexican Green Chile Powder. I did use a small can of chopped green chiles because it isn't Hatch Chile time right now. But with the addition of the Green Chile Powder, you may not need to. It just depends on your spicy level. Don't worry, we are going to keep this simple and VERY flavorful. I boiled 5 boneless, skinless chicken thighs for this recipe. I love the moistness of thighs, but if you want to use a half of a pre-cooked rotisserie chicken from your grocery store, then do it. You can also use breast portions if that is what you like. NO rules on the chicken! Set your oven to 350°F degrees. Spray your pan with cooking spray. In a bowl add shredded chicken, onion, 1 teaspoon of the New Mexico Green Chili Powder and one cup of cheese into a bowl. Mix together. Assemble your enchiladas, remembering to put them seam-side down in your pan. Set aside. In a medium sauce pan melt butter. Stir in flour, cook only until just bubbly. Gradually add broth and allow it to come just to a simmer. Remove from heat and add 1/2 cup of cheese, chiles and 1/2 teaspoon of New Mexico Green Chili Powder. Mix together. Add sour cream. Pour over your enchiladas. Top with remaining 1/2 cup of cheese. Cook about 25-30 minutes or until all bubbly and fantastic. I hope you enjoy this dish. And please stop by The Spice House and look at the amazing spices they offer. It is a wonderful company and I know you would be happy with anything that you picked!! Canned Green Chile is terrible, raw, probably not New Mexican, and brine flavor. Need fresh frozen New Mexican Chopped Green Chile. I'm sorry you don't like canned green chilis. I get Hatch Green Chilis and do not find them briny at all. If I had access to fresh frozen I would definitely use them. Please feel free to use any chilis you want. Traci, these are delicious! My whole family loved them! Please try them....simple and very good. Let me know if I can help.